At Top Notch Towing, we have a special team and specialized tools for secure and damage free motorcycle towing. Our motorcycle towing service is carried out be experts who are specially trained to tow a motorbike, understand how motorbike works and can manage a secure motorbike towing with their left hand! Why choose Top Notch for Motorcycle Towing? Local Experts - We are a team of people from Salt Lake City for the people in Salt Lake City. Whether you are a local resident, a tourist or on a short trip for work and riding around a motorcycle, we will make sure that we get to you quickly as we know the shortest ways, get you the absolute best of service and make sure your experience with us is pleasant all through the way. Well Equipped - We understand the difference between motorcycle towing and towing other vehicles and we have the right equipment to make sure your motorcycle is not damaged and secured safely. We assume all safety and security methods for a safe and damage free experience. 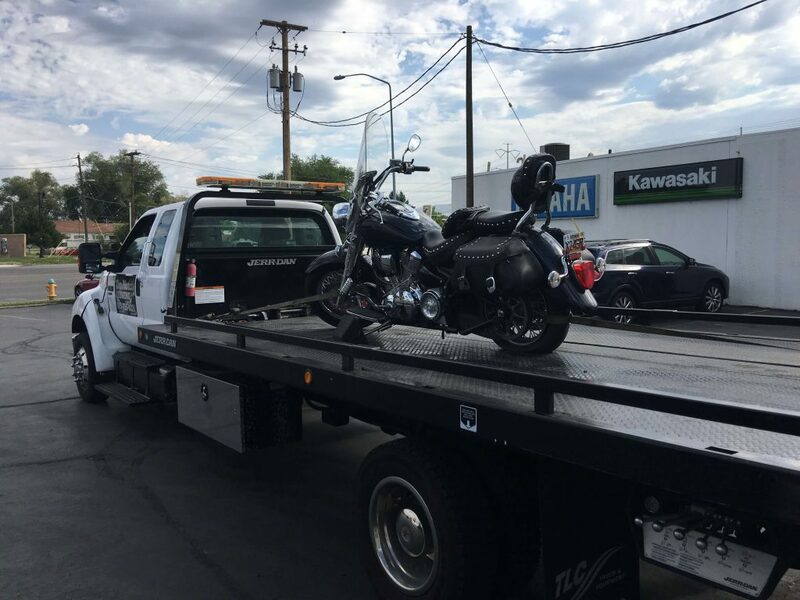 Reliable - Top Notch Towing is the most reliable motorcycle towing service in Salt Lake City. We are built over years of experience and expertise and 100% quality is our main focus. We offer customer centric services, keeping your needs as our priority. Immediate Action! - As soon as we receive a call from someone in need of motorcycle towing service we get into action immediately! For us every situation is an emergency as we want you to be safe and hassle free. With Top Notch Towing you get only the best of quality in services! Just get in touch and our efficient motorcycle towing team will be with you right away. Riding on a motorcycle through the wide and open roads of Salt Lake City, Utah, with fresh air enveloping you can be the perfect way to unwind and get your adrenaline pumping! Riding the motorcycle through the city can also be a faster way to get from one place to another, navigate through the traffic and of course have fun on the motorbike at the same time. The only thing that can make this experience bitter is an unexpected pit stop! Accidents, break downs, flat tires... sound familiar? While we hope and wish you travel safe and enjoy a great motorbike riding experience, we also hope that if you are stuck or in need of assistance you know who to call! Get in touch with Top Notch Towing for reliable, quick and efficient Motorcycle Towing service, whenever and wherever you need it. We are based out of Salt Lake City and we know the best and shortest routes to get to you quickly. Motorcycle Towing has become a much in demand service as the passion and need for motorcycles is growing. Out of convenience and out of love for riding motorbikes, many people today prefer to ride around the city instead of driving or taking the public transport. It’s definitely faster and allows for easy navigation. That said, getting stuck in a situation like an accident or break down on a motorbike is slightly trickier than a car; especially if you are little outside highly populated areas. Firstly, you can’t just sit easily and wait for help; secondly not every towing service is equipped to help motor bikes. Towing trucks and vehicles for motorbikes are different from those of cars and even the whole process of securing the bike to the truck requires expert and technical knowledge. Many people have suffered damages to their bikes because of inexperienced towing services handling their vehicle.